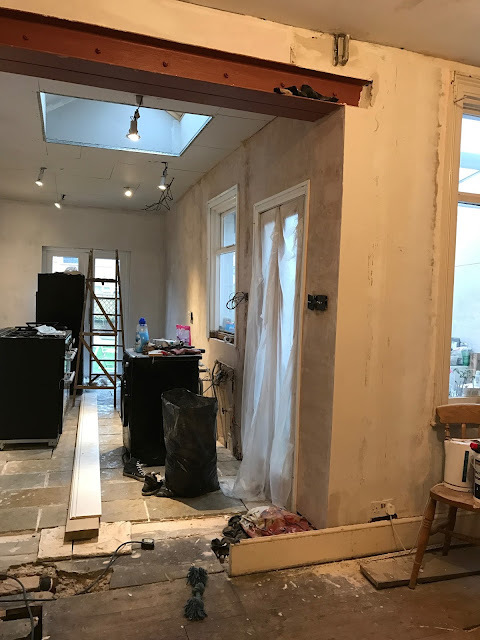 We spent much of the summer plaster-boarding walls (you can read all about that here) but it took many months later to actually get plastering. And to couple that, since it's was Grants first time plastering away from the course, we also decided to do it in very small bite-size sections. 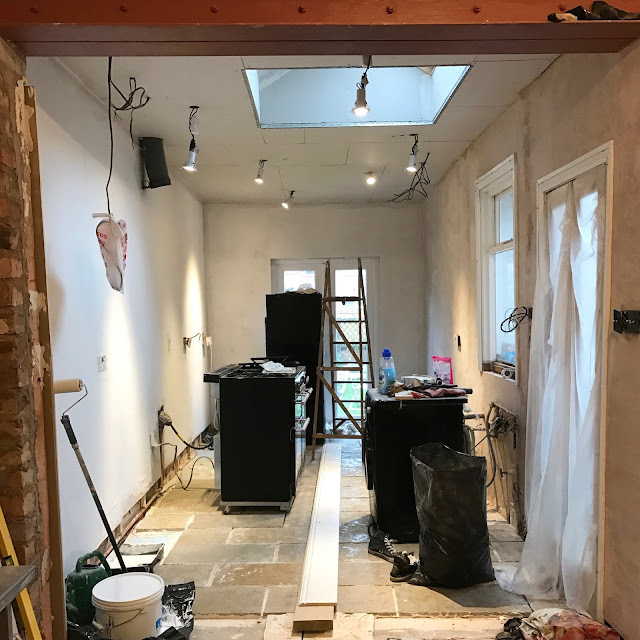 So unlike paying a plasterer who will probably be done in a day or two, for us - it took many weeks, little by little, as and when we had the time free to get it done. And so maaaaaaany months later, I can now share the final results with you! So, you may (or may not!) 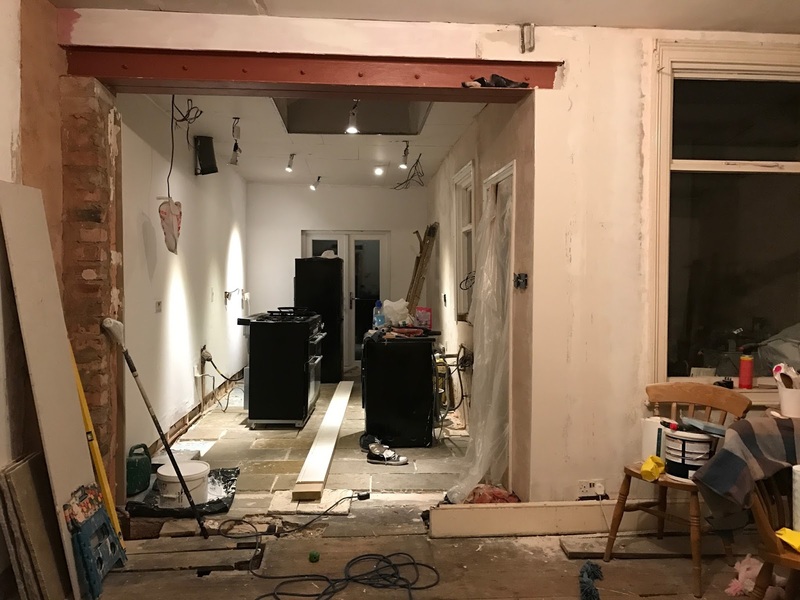 remember our now-kitchen actually used to be two separate rooms. 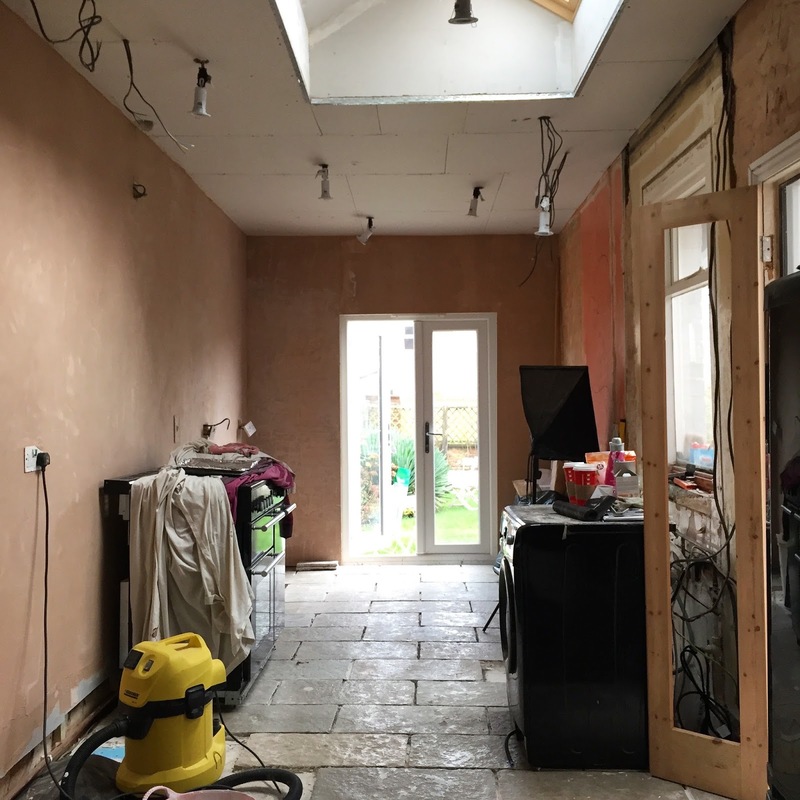 One was the downstairs shower room, and the other the kitchen. After hacking a load of tiles off from all the walls, it was pretty obvious they needed re-plastering. Along one side, we've opted to install new plasterboard with battens, around the french door we've used an insulating plasterboard and along the other side, we're just plastering straight over the old plaster. If we were to use plasterboard on this side, the windows and doors would have become more recessed and we really didn't want that. 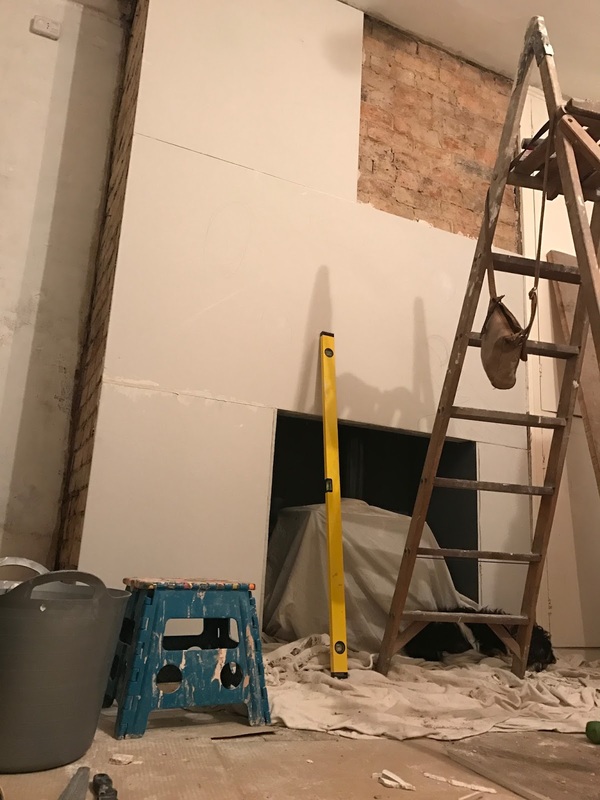 We also didn't want to remove the old plaster, because well - it was actually some kind of cement render and a flamin' NIGHTMARE to remove. And we really couldn't see any benefits in doing so, other than causing a lot more mess and requiring a lot more money. 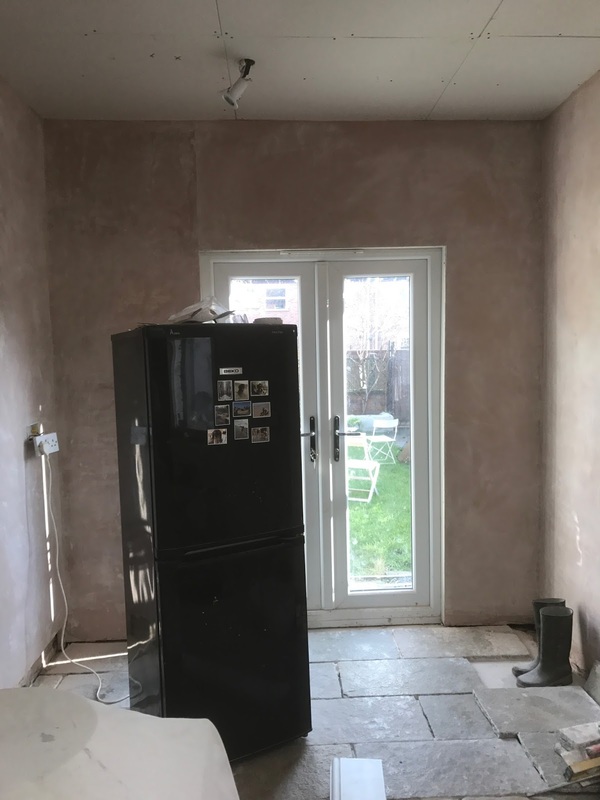 For all these areas, we've mostly attached plasterboard over the brickwork using the dot and dab technique, to give a suitable base for plastering. 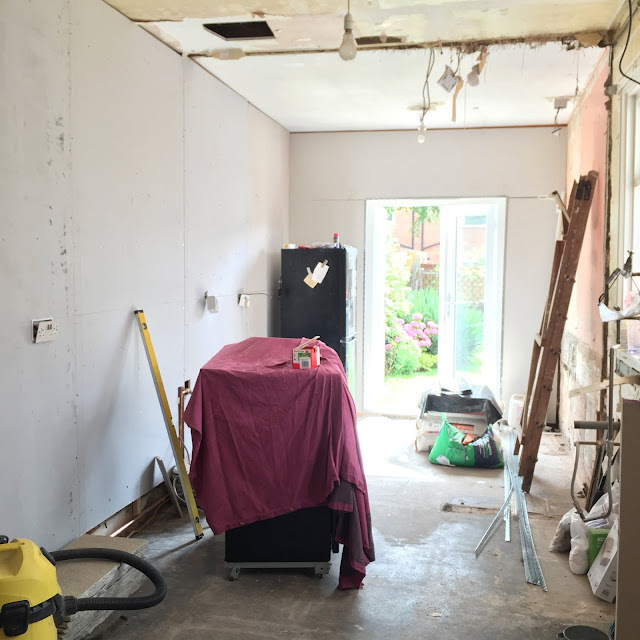 I use the word 'mostly' because in some areas, plasterboard was just too thick. For example, the steel beam which we're keeping exposed sits perfectly in line with the brickwork. 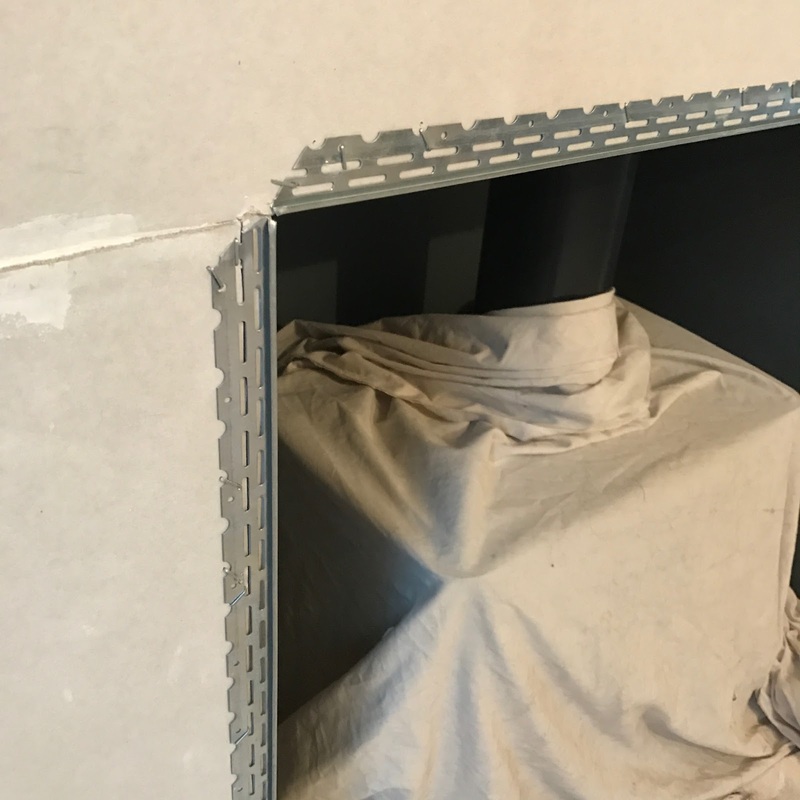 To add plasterboard would have made the the beam then recessed by around 2cm and we really wanted everything to be flush and line-up perfectly, without any awkward edges, so we've used browning/bonding plaster as a thinner base in some sections instead. It all took A LOT of thought and planning, but we got there in the end! As I said before we opted to do this bit by bit, sectioning off areas in scrim tape and then blending and feathering the plaster in to join against the next section. The system worked pretty well (you can't see any of the joins, but we did need to sand them!) and it meant Grant could give his full attention to a small section, rather than stretching himself thin over a larger area. The first wall Grant tackled was definitely his worst and he even ended up going over it a few weeks later once he felt he had perfected the technique a little more. 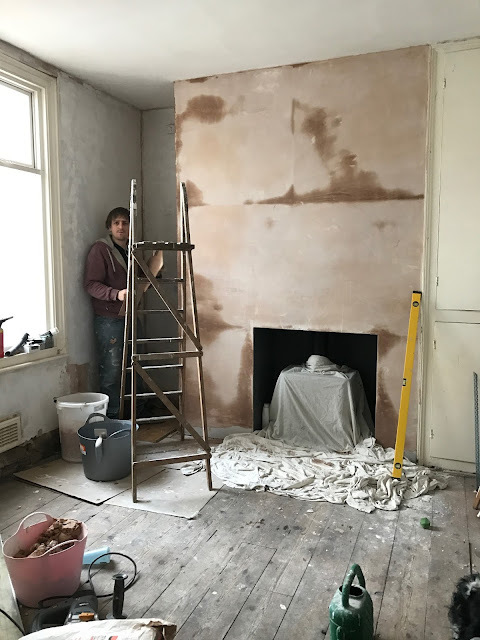 Having left a few months in-between learning to plaster on the course and actually doing it, needless to say meant he had forgotten a few things. 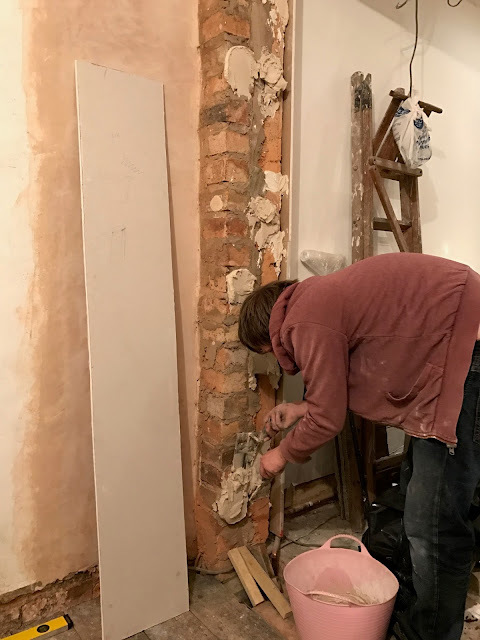 Like what consistency of plaster is best - one of his biggest mistakes on the first wall was definitely mixing the plaster too thick, which caused it to dry out much too fast and become a pain in the arse to smooth out. But I have to say, with each wall he tackled there were less and less dings or imperfections. Any bad spots were very luckily (or was it strategy?) in areas that would be covered by the fridge or wall dresser, or cupboards. I will however say, the floor took one hell of a beating. He definitely gets zero points for tidy and clean working! Once the main walls in the kitchen were done, we could then move onto some of the smaller, but fiddlier sections. I used a pre-mix plaster skim for some of the smaller more tedious areas around the beam - it's sand-able and basically more like a glorified filler which is a little more forgiving if you don't get it right first time. 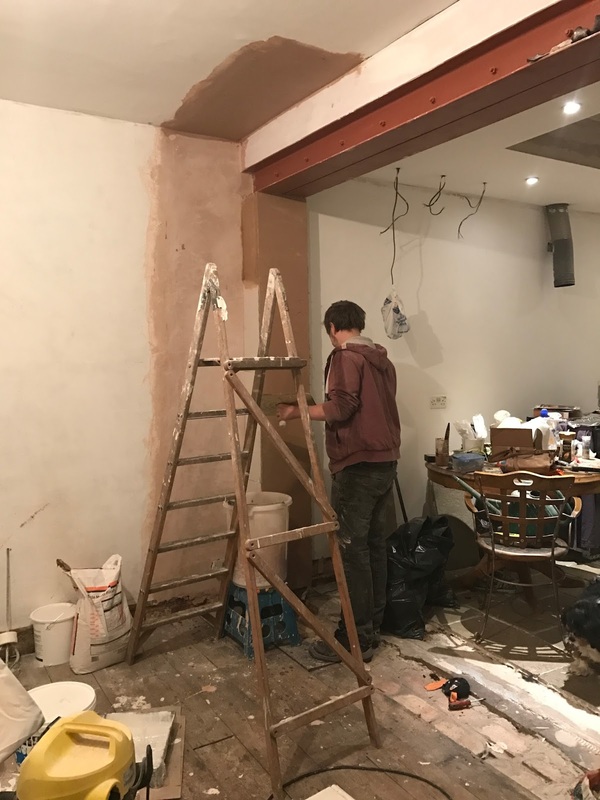 We were also able to paint straight onto the plasterboard along the top of the beam as Grant had very skilfully fitted in one length with the most perfect cut. It was so good, it actually seemed totally unnecessary to plaster! 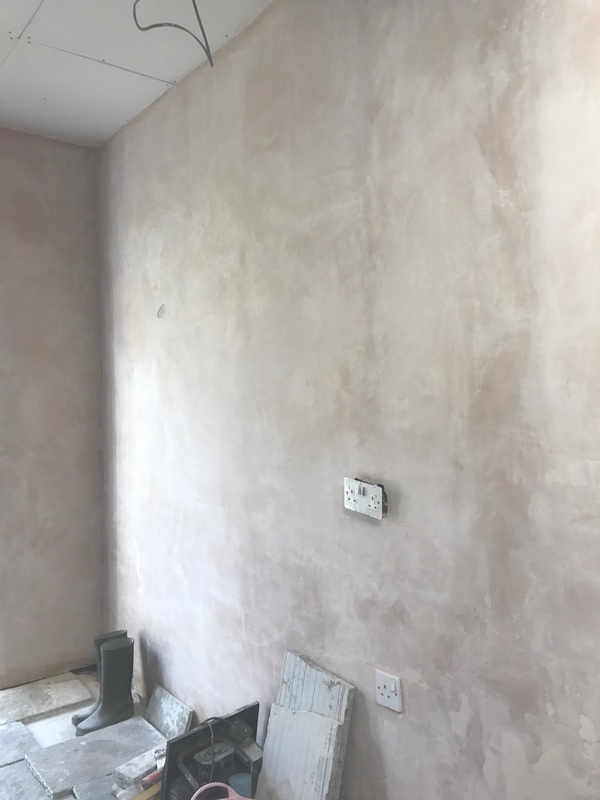 Again, a bit of pre-mixed plaster skim I was able to blend the join into the original plaster, so it now looks completely seamless. 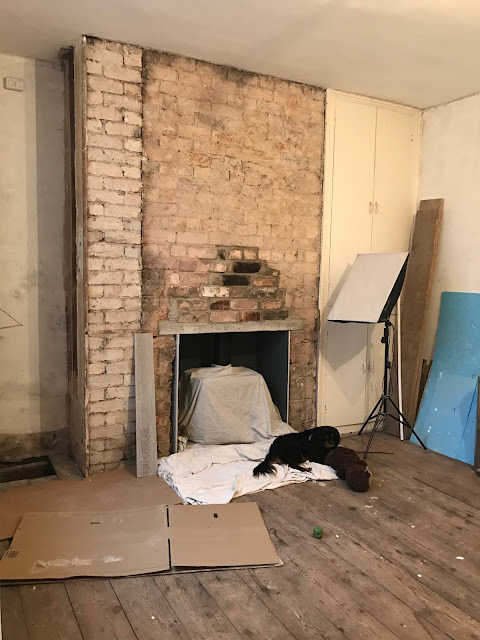 The exposed brick where the old cupboard used to be also got a coat of browning. Plasterboard was again too thick to join up with the original plaster, so we're plastering straight to brick here. 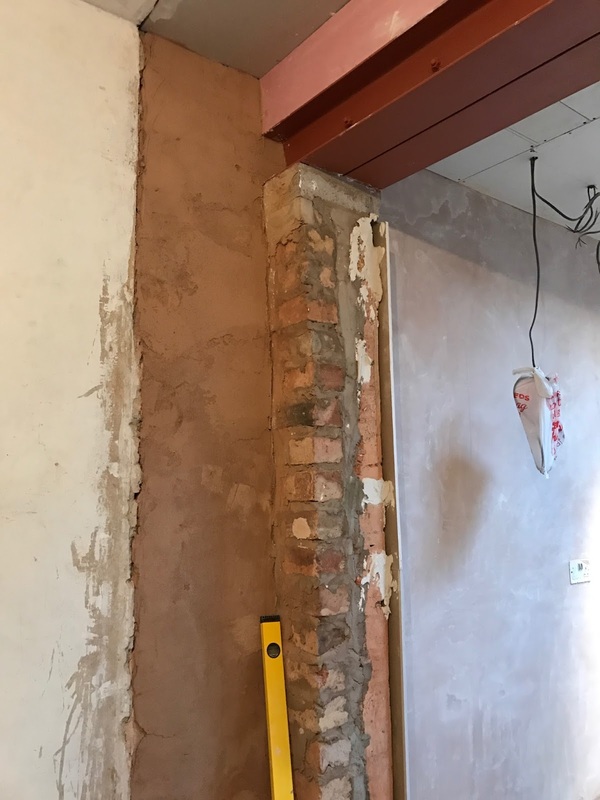 And the pillar got boarded up, leaving a very small section to brown, again just to blend it in gently to the steel beam, so it's not massively thicker at the top. Am I making sense? We'd already boarded the inside of the chimney with a fire-resistant cement board back when we installed the log burner (read how we fitted it here). 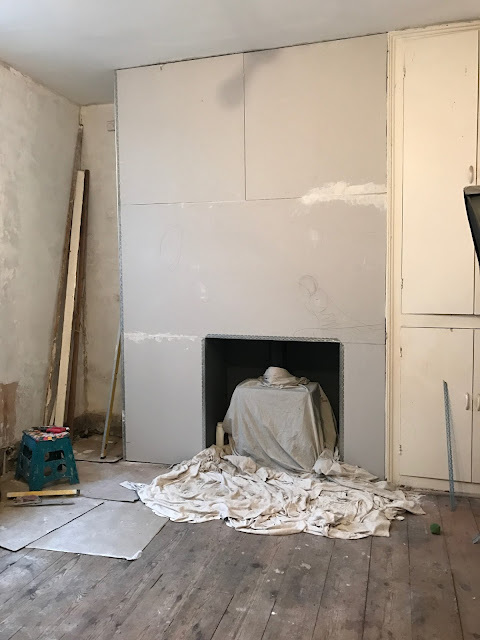 This can't be plastered as the heat from the fire would be most likely to crack the plaster - so we're using a angle stop bead, which allows you to plaster up to the corner, giving it strength without having to use a corner bead, which would otherwise need plastering in along the other side. 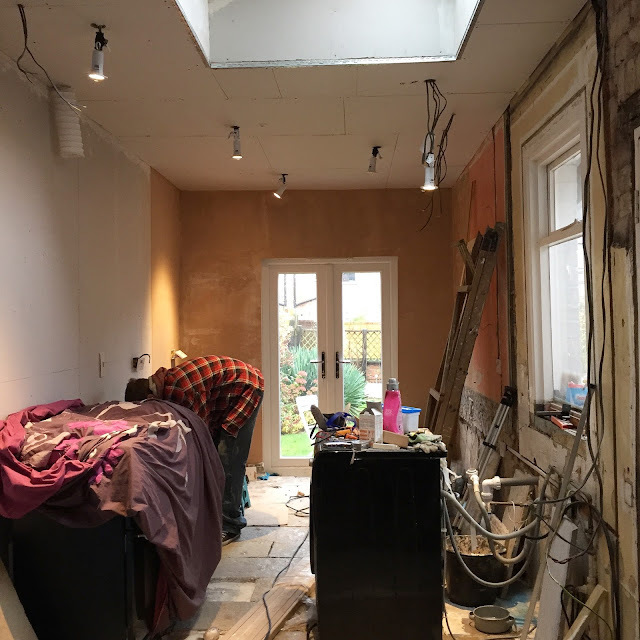 We'd also fitted the cement board with an overhang so that it would match up with the plasterboard and luckily everything worked out the way we'd planned! Some plastering later and finaaaallly we were complete! 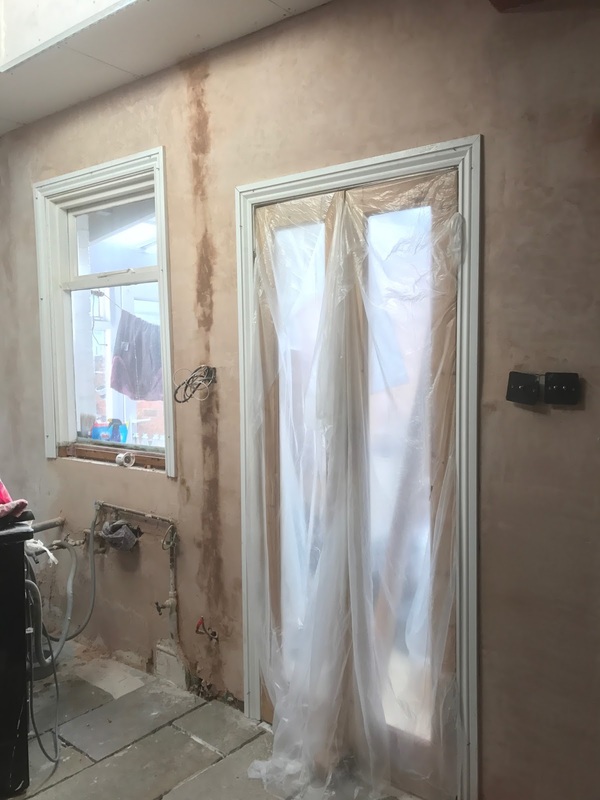 I could grab a load of wet clothes, dusters and spend many hours hoovering in the hope we would now be plaster-dust free! Get yourself a good trowel. No cheapy shortcuts here or you'll regret it later! We thoroughly recommend the Marshalltown Permashape trowels! Consistency is key. 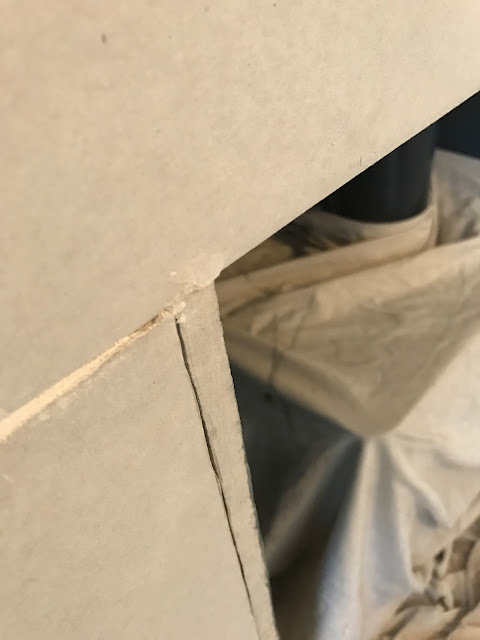 Mix your plaster too thick and you'll be having a nightmare, too thin and half of it will end up either on top of you, or on the floor. Timings - Don't be tempted to smooth out too early. 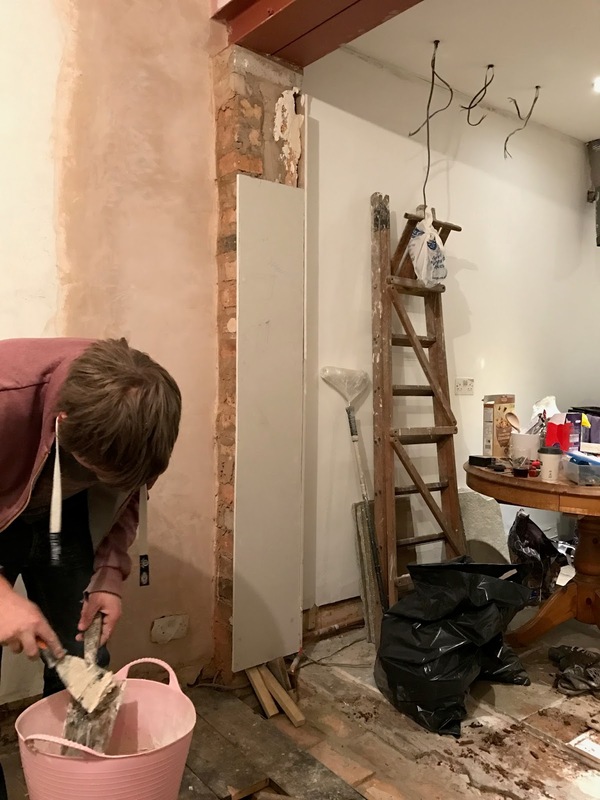 Learning when to take a break and let the plaster firm up is one of the hardest but most important factors to learn. Don't overstretch yourself - Stick to small walls that you can really give your full attention to, without the pressure of having to do too much. 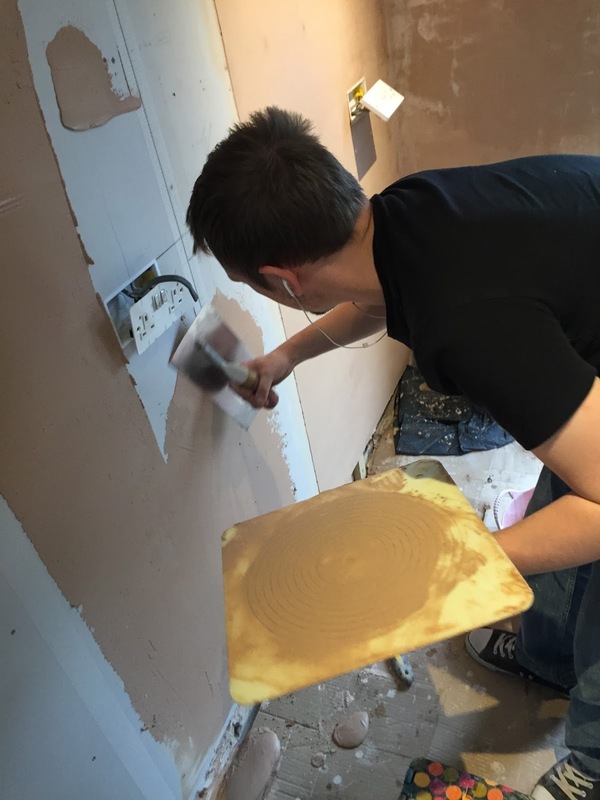 Find a friend - having someone to mix plaster for you is essential. Mixing is so time-consuming, so having someone on hand to do it for you will make the whole experience a lot less stressful. 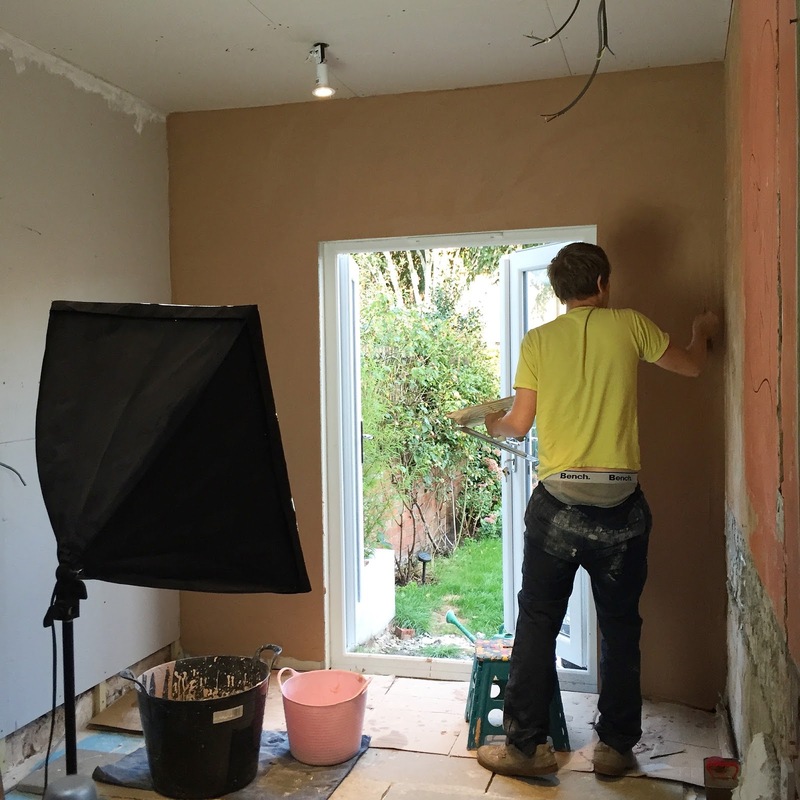 Keep your tools wet - A fresh bucket of water is vital when plastering. Don't let plaster dry on your trowel or you'll be picking lumps of plaster off the wall for weeks after. Good Lighting - You'll notice we use weird stage-like spotlights. They were cheap and help to give good lighting even when plastering late at night. It's important the lights aren't too bright though, or this can just help hide imperfections. But obviously too dim and you'll also miss a load of impertions too. You have to find the right balance of light! Keep the heating off - At least whilst you're plastering that is! 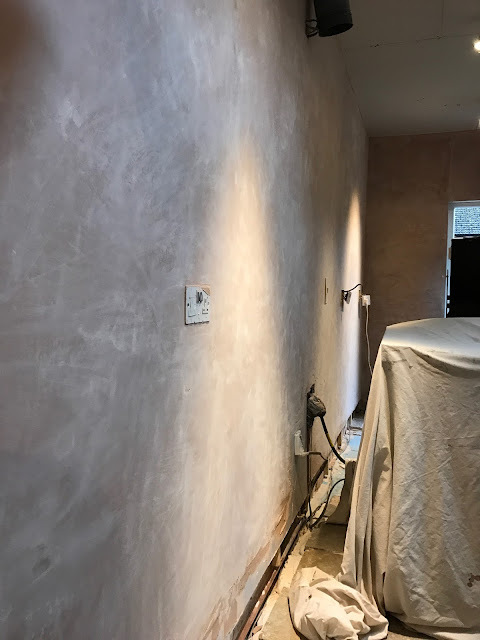 Plastering under too much heat can make it dry far too quickly and you'll be forever stressing. Keep the radiators off until you've finished. And if possible, avoid plastering on the hottest days of the year! Be prepared to possibly have to sand your plaster down - You may not get the perfect finish first-time DIY plastering. 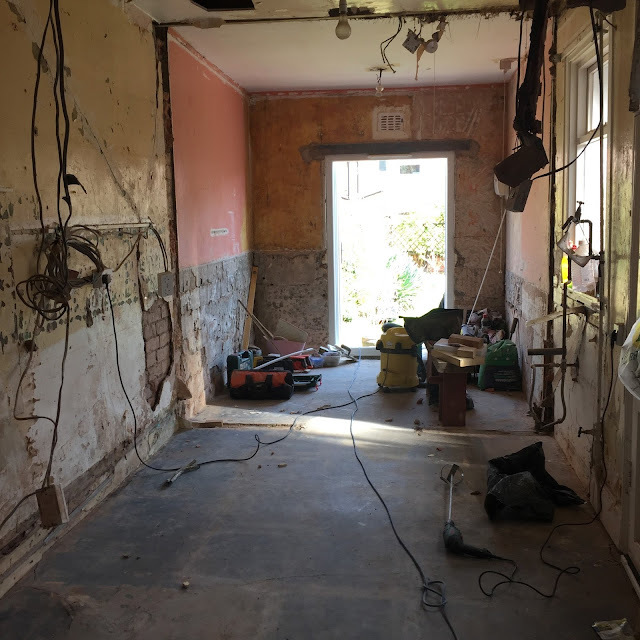 So do be prepared to spend some time afterwards sanding and then cleaning up plaster dust. It's a faff but worth it for the best results. 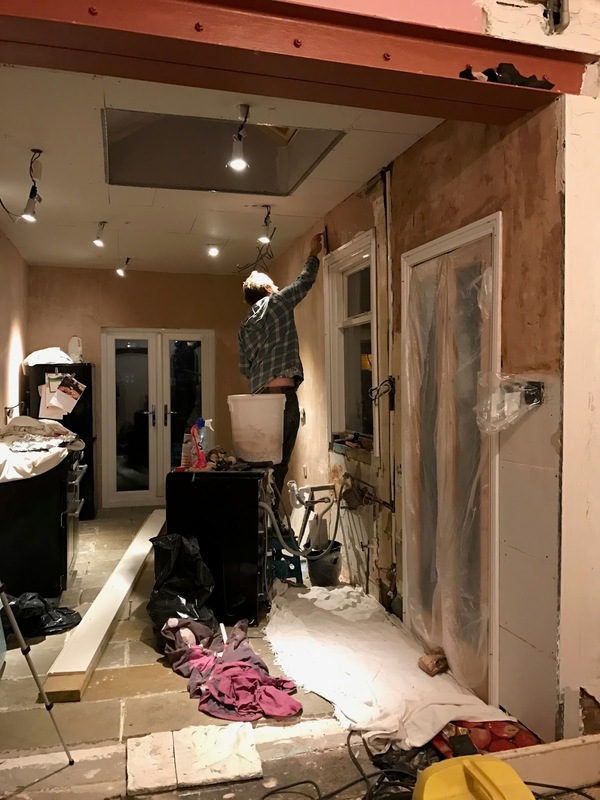 After many months of plastering - This is even how we spent our New Years Eve(!) we now have something that looks a whole lot like an actual room! We've saved mega bucks doing this ourselves, but we have had to put a lot of time and effort into getting it done right. It's been a challenge, but one that we can use elsewhere in the house hopefully and in the long-term will really pay off! 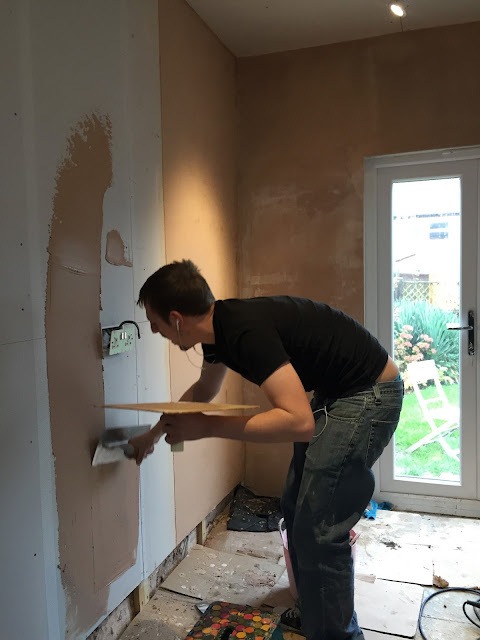 Have you/Would you do your own plastering, DIY-Style? 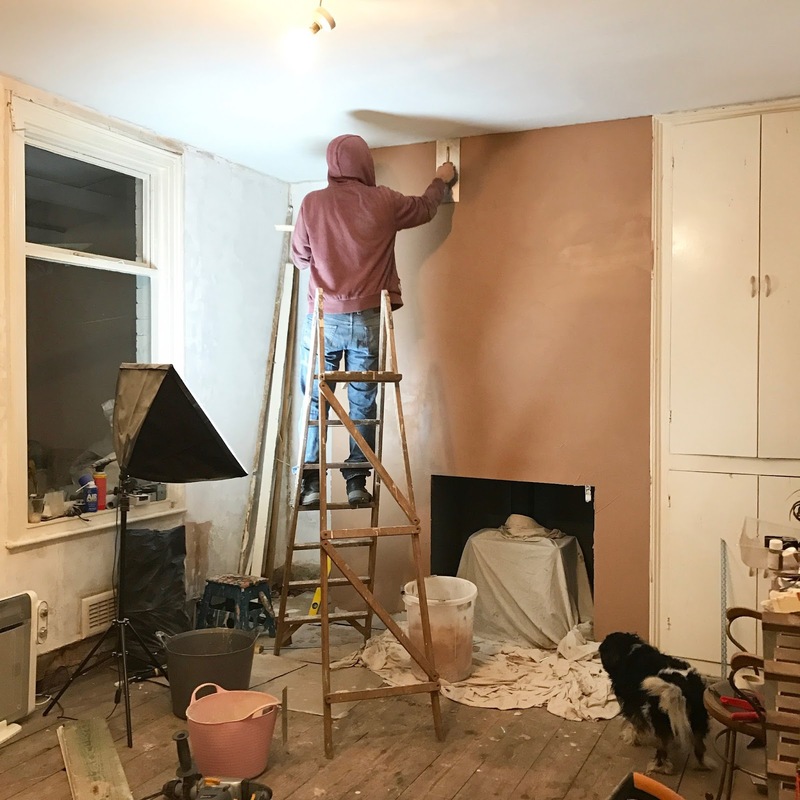 This is a great guide, the difference between working with plaster and plasterboard is something a lot of DIYers can learn from! 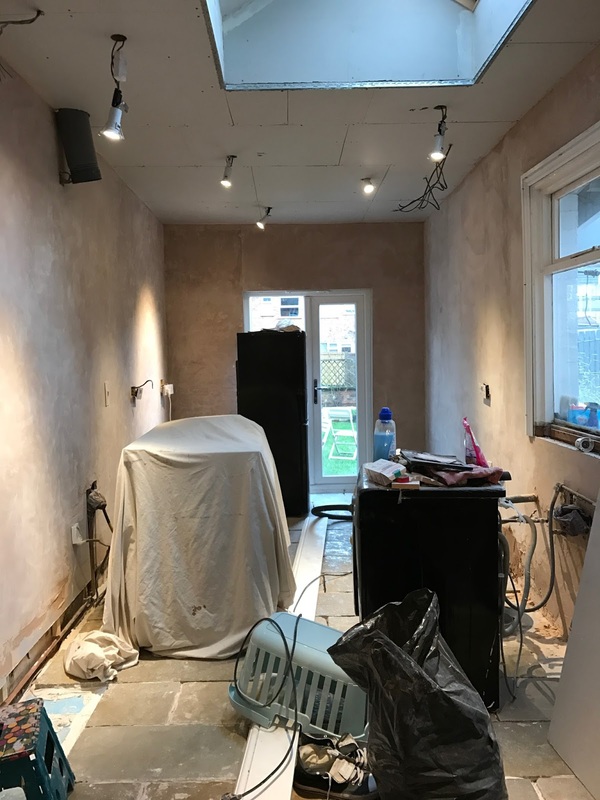 Did you consider insulated plasterboard for your project? It's not too pricey and can save loads through energy efficiency.